Just because your ski boots are waterproof does not mean that the liners will never get wet. In fact, ski boot liners not exposed to wet snow still encounter moist, sweaty feet. 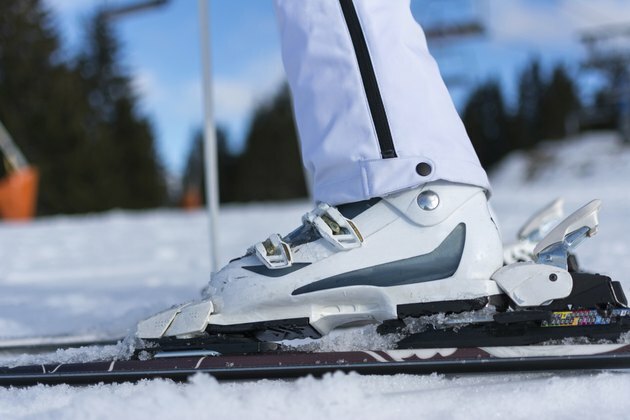 Moisture can cause your ski boot liners to develop an unpleasant odor, which requires immediate attention to combat the smell. While some manufacturer's recommend machine-washing and drying your ski boot liners, most people prefer hand washing. This is especially true for fitted ski boot liners, which are subject to shrinking in the washing machine and dryer. Remove the boot liners from your ski boots. Simply unfasten the boot buckles to widen the boots, and slip the liners out. Fill a basin with cold water and a squirt of detergent. Insert the liners into the soapy water. Allow the ski boot inserts to soak for 10 to 15 minutes. Remove the inserts from the soapy water. Give the ski boot inserts a cool water rinse under the tap. Hang the inserts to dry on an indoor or outdoor clothesline. If you do not have a clothesline, stand the inserts upright on a hard surface to dry. Do not wash ski boot inserts in hot or warm water. Either can cause the ski boot liner to shrink. Hot and warm water can also loosen any glued areas of the insert. Do not hang your ski boot inserts in areas that contain high heat or direct sunlight. Does Washing With Cold Water Cause Dry Skin?